Whether they're used to bolster heroes' abilities or take enemies out of the game, potions and poisons are key parts of many adventurers' arsenals. Far more options than simple healing draughts or strength-sapping toxins are available to savvy heroes, though, especially those ingenious enough to craft their own concoctions. 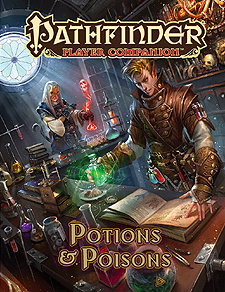 Pathfinder Player Companion: Potions & Poisons offers a sea of new potions, elixirs, and stranger alchemical wonders for the discerning adventurer, plus heinous designer poisons. Class and character options for those who brew or regularly imbibe consumables round out these offerings. Feats and archetypes for races with an affinity or poisons, including gripplis, nagaji, and vishkanyas, plus the scorpion sorcerer bloodline for those with a toxic heritage. Archetypes for a variety of classes known for brewing or poisoning, including alchemists, rogues, and witches. Spells and feats specialized for potion brewing, plus drugs, elixirs gear, poisons, and tinctures - alchemical remedies that produce potent effects but impair the user.